It isn't uncommon for temperatures in Phoenix to be over 100°F in the summer. Is it true, though, that when the air temperatures get up over 115°F that Sky Harbor Airport cancels flights? As temperature increases, and humidity increases, the air becomes less dense, and therefore the air creates less lift for the airplane. It follows, then, that airplanes need more runway to take off. In 2000, the north runway at Phoenix Sky Harbor International Airport, the longest, was lengthened to 11,490 feet. Each airplane has its own specifications that dictate, based on weight, engine performance, temperature, humidity, and elevation how much runway a pilot requires to safely take off. For example, on June 29, 2013, the high temperature for that date was recorded as 120°F just after 4 p.m. US Airways (subsequently merged with American Airlines) had aircraft utilized for regional flights where the specs recommend takeoff at below 118°F. There were 18 flights that were delayed briefly on that day by US Airways for that reason. Their mainline Boeing and Airbus fleets have performance data allowing them to take off in temperatures of 126°F and 127°F, respectively. Let's hope we never have to test that data! Could a flight be postponed or canceled due to high temperatures in Phoenix? 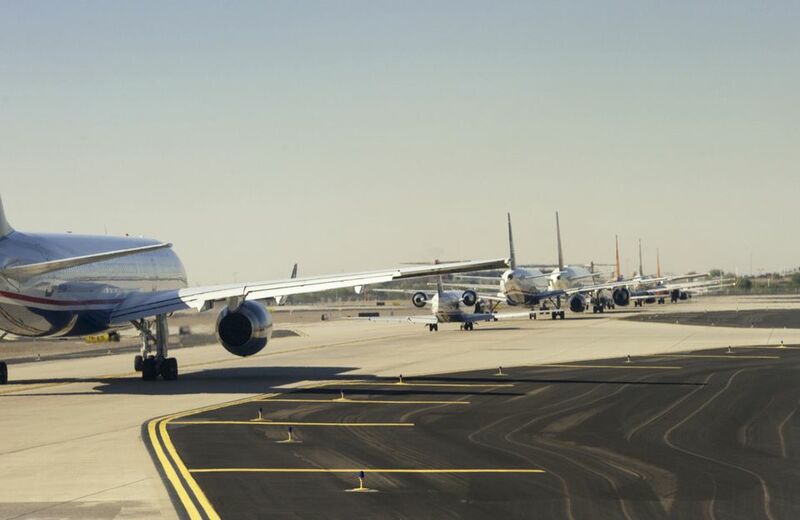 There are very few occasions where the temperature at the time of takeoff of any of our commercial flights at Sky Harbor International Airport creates a dangerous situation. Airlines certainly have the right to have more stringent requirements than the FAA does. An airline can choose to postpone or cancel a flight at any time. Sometimes air carriers will reduce their cargo loads on very hot summer days. It's unlikely that they would reduce the number of passengers; reducing cargo would make a bigger difference in weight. In the case of Phoenix summer temperatures, it's more likely that the flight might be postponed for a little while so that passengers and/or cargo are not left behind. The Federal Aviation Administration tracks airport delays in the U.S. You can see general traffic delays as well as weather-related delays and cancellations here. Learn more about Phoenix Sky Harbor International Airport: Features, Rental Cars, Transportation, Maps.